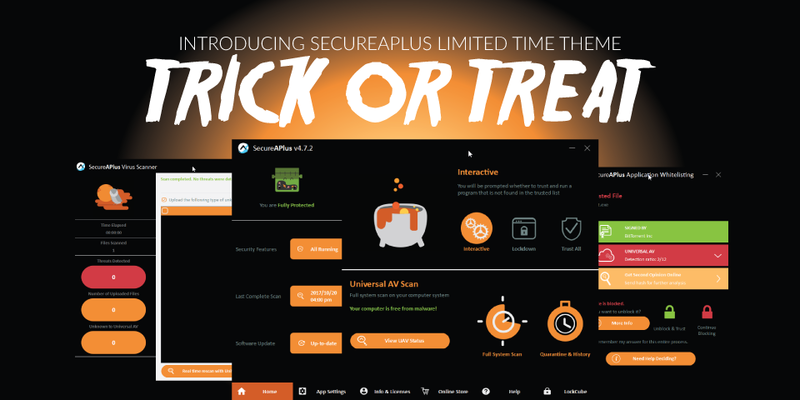 It’s been a long time coming, but what better way to celebrate the time of the year when kids and kids at heart alike suit up as ghosts, ghouls, and characters from popular culture than to release a dedicated SecureAPlus theme to celebrate the occasion? A Halloween Antivirus is just what you need! Starting today till the end of the Halloween season, you can now download and install the brand new Halloween Theme for SecureAPlus called “Trick or Treat”. Sporting a mainly black aesthetic with pumpkin orange hues that stay with the tried and true visuals of the occasion, it is complemented by the judicious use of popular Halloween icons such as skulls, ghosts, Frankenstein’s monster and coffins with a whimsical twist to convey normally scary imagery as something more safe and inclusive for a Halloween Antivirus. But it’s not all fun and games. While clean and safe files get a treat, SecureAPlus is still the powerful anti-malware and anti-ransomware software that leverages application control and application whitelisting to keep malware and ransomware from tricking you into letting them into your system. Finally in the mood for a Halloween Antivirus? Get the Trick or Treat theme for free today at the Themes Page of the SecureAPlus Account Portal. Click Here to learn how to apply themes to your SecureAPlus. No Account? Click Here to Create One Today. And one more thing… While a Halloween Antivirus theme is good and all, people have been asking for more themes on the portal. 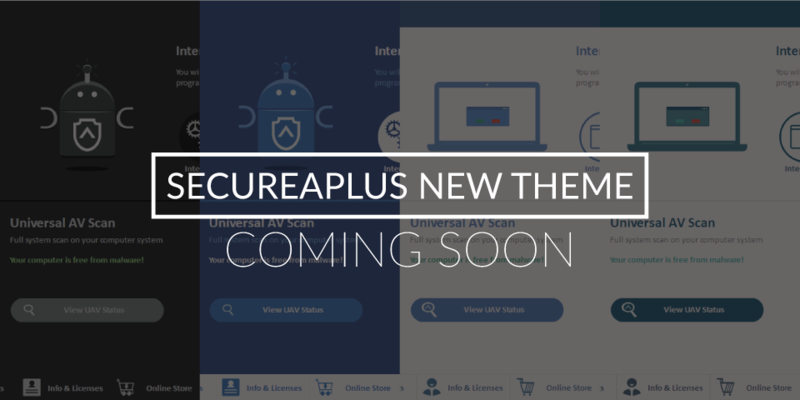 We’ve been working on it – look out for more themes coming out soon at the SecureAPlus Portal. Trick or treat with peace of mind with a security solution that embodies a Halloween Antivirus feel.